INTELANALYSIS is an occasional publication of Gerard Group International, Inc. bringing you news and commentary that you may not be getting in the general press. World news continues to flow with story after story that commands headlines: Japan's catastrophic earthquake and tsunami, Libya's ongoing rebellion, Egypt metamorphosis from democratic rebellion to Islamist nation, Bahrain, Yemen, Pakistan, and much more. But other important stories continue to slip through the cracks. They are important, not only because of their obvious content, but also because of what they represent within the larger scope of world events. It is our goal to bring you theses stories and provide you with analysis that will help to put them in perspective with the larger picture. Over the coming days, we will bring you articles about the broader implications of Japan's disastrous earthquake and tsunami, the importance to evolving history of the rolling rebellions in the Middle East and how events in Libya Yemen, and Bahrain have temporarily halted their spread, and about Iran's continued activities to exacerbate the volatile climate in the Middle East and beyond. America has a role to play in every story. The implications of our reluctance to get involved are significant. This will be one of the threads that will be covered in future stories. Early Tuesday morning, March 15, the Israeli navy commandoes intercepted a freighter off the country's Mediterranean coast. The German cargo ship, the Victoria, was ostensibly delivering cotton and lentils to Egypt, but when the containers were opened, the contents were found to be 50 tons of weapons bound for Gaza. Among them were Chinese-made C-704 anti-ship missiles would have threatened Israeli sea-based strategic installations, navy vessels had they reached Strip. Also found on board were missile identification manuals written in Pharsi, the official language of Iran. According to the Israeli military, the naval commandos met no resistance while boarding the Victoria during a routine inspection 200 miles offshore, and they towed it to the Israeli port of Ashdod. From the beginning, it was clear that the records on board were not in order. According to official logs, the arms ship left Mersin, Turkey, heading for Egypt. The Victoria, which was masquerading as a commercial ship, originated, not in Turkey, but in Latakia, Syria, where the weapon containers were loaded on board two weeks ago. According to our sources, the ship made a brief stop in Turkey, more for disinformation than for commercial purposes, and then resumed its voyage, ostensibly bound for Egypt. However the vessel actually was bound for Gaza, to deliver the weapons. In addition to providing a Mediterranean home for Iran’s navy, the deal provides for the construction of a weapons depot for Iran’s Revolutionary Guard, housing and base facilities for incoming troops, and logistical support for its submarines. It also provides a resource for transporting arms and personnel to Gaza. This is the scenario that was playing out this week until the Israelis intercepted the Victoria, and the one that we warned about when the Egyptians allowed two Iranian warships through the Suez Canal, bound for Latakia. In November 2009 Israeli stopped the Iranian freighter Francop off the coast of Cyprus, capturing hundreds of tons of rockets, missiles, mortars, grenades and anti-tank weapons on board headed to Hezbollah guerrillas in Lebanon. In January 2002, Israeli forces commandeered the Karine A, an Iranian freighter approaching Gaza on the Red Sea. Israel displayed the weapons confiscated for the international press. The Karina A was carrying 50 tons of missiles, mortars rifles, and ammunition headed for the Gaza Strip. ANALYSIS: Iran’s goal is clear. The cargo on the Victoria represents a clear effort by Iran to escalate their involvement in the region by playing a more active role in delivering arms to the anti-Israel factions. The Iran, Syria, Lebanon (Hezbollah) axis is lined up to wage war on Israel. An effort now underway to shore up aggressive power in Gaza as well will ensure the probability of a pincer attack capability against Israel from north and south when the time comes. And the time will come when Ahmadinejad thinks he is ready. Add to that the current radicalization of Egypt, allied to the anti-Israel forces of Iran, Syria, Hezbollah, and Hamas, and the situation becomes even more dangerous. Whether we like it or not, whether Israel is ready or not, war is likely to come again to the region – and all evidence leads to the probability that it will be sooner rather than later. Given the acceleration of instability in the region, it is likely to be no more than a few months away, with the early months of summer being most likely. America needs to decide which side we are on. The dead included the parents, Ruth and Udi, and three of their six children, 3-month old Hadas, 4-year old Eldad, and 11-year old Yoav. THE STORY: Late last Friday evening, following the beginning of the Jewish Sabbath, terrorists broke into a small house in the town of Itamar, after the family had gone to bed, and stabbed five members of the family to death in cold blood, including a three month old baby girl. They entered through a living room window. They apparently overlooked the 6-year-old boy sleeping on the sofa in the living room, because they went directly to a bedroom where they found the father asleep with his newborn baby girl. They slashed the father's throat and stabbed the infant to death. Then the mother came out of the bathroom, and she was murdered in the doorway where she stood. They then moved on to another bedroom, where they slashed the throat of the 11-year old-son who was reading in bed. They missed the 2-year old asleep in his bed, but murdered his 3-year old brother with two stabs to his heart. Then they fled through the window and escaped. The family’s 12 year-old daughter, Tamar Fogel, escaped from the house and went to neighbors next door. When they returned with her to the Fogel home, they found Roi, 8, sitting in shock in the center of the living room, and two-year-old Yishai, weeping over the bloody bodies of his parents. When the news of the murders reached Gaza the following morning, the residents handed out candy and sweets, in celebration of the massacre, and Hamas websites called the murders “a heroic operation”. Two cousins have been arrested and are now in Israeli custody, suspected of either planning or carrying out the slayings. One was identified as an officer in Palestinian President Mahmoud Abbas' Preventative Security Services in the northern West Bank city of Nablus. The second is an officer in Abbas' General Intelligence services in Ramallah. In addition to enhancing the country’s internal security in advance of the upcoming Purim holiday, Israel's public response to the massacre was to announce plans to build hundreds of new housing units in the West Bank cities of Ma'ale Adumim, Ariel, Kiryat Sefer, and Gush Ezion. The announcement was made in direct response to the murders. While the United States Embassy in Tel Aviv expressed “deep concern” over the announcement, and the UN released a statement saying that the plans to build more housing units were not “conducive to peace”, Prime Minister Benjamin Netanyahu said simply, "They shoot, we build". In order to help the world understand the depravity of the attack and the reality of daily life for Israelis, photographs of the scene were released by members of the victims' family (Warning! These are graphic photos of the Fogel house after the murders. Because websites sometimes pull down content considered too violent or graphic, we have listed three different sites where you can still see them here, here, and here.) We make them available to you because we believe that it is important for the world to understand how far our enemy will go and to what depths they will sink in order to defeat us. We must not trivialize or dismiss these murders, because the terror that Israelis face every day is not so very far from where we live. The same hatred that consumes the enemies of the country they call “the little satan” (Israel) also threatens those of us who represent to them “the big Satan” (the US). These photographs show real people, murdered in their sleep by monsters who justify the killing of babies for political and religious reasons and call it heroism. ANALYSIS: We have become used to our government's caution in responding to such events. But it is difficult to understand how the administration refrains from comment in the face of such an atrocity, but responds immediately through its embassy in Tel Aviv when the Israeli government says it will build new apartments in disputed territory in response to the murders. Our values seem to be deeply confused and the message we send to allies and enemies alike put us at a grave disadvantage in the world of global affairs. As the US administration tries to maneuver through the maze of international diplomacy, it is all too clear that on the global stage, America is being marginalized by its own foreign policy. America has long been a leader in global affairs, but today our nation is distinguished by its inability to lead, at a time when real leadership is most urgently needed. Over the years, the United States has continually pressured Israel to participate in 'peace talks' with the Palestinians and to make major concessions, even before negotiations begin. This continues as a cornerstone of our foreign policy, even though incidents like this horrific multiple murder make it clear that the Palestinians are not reasonable partners in peace talks. Perhaps it should come as no surprise that the U.S. trains, arms, and funds both of the Palestinian's elite Preventative Security Services and the General Intelligence Services of Fatah, the same organizations from which the murderers came. It is not too far a stretch to suggest that these are the people who wear the uniforms during the day, and make the bombs at night, something we should have figured out a long time ago. Israel has been a staunch ally to the US and has never wavered in her loyalty to a succession of American administrations, Democrat and Republican. But America has not been a constant fried to Israel. An erratic policy towards Israeli security issues, one that gives with one hand and takes away with the other, has kept this tiny country on the hook for many years. Today, Israel still appears to be wiling to placate its American 'friends', even at the expense of its own security. Trying to curry the perceived cooperation of the State Department, long criticized for its anti-Israel bias, may be Israel's Achilles Heel, because the ingrained biases of the agency are not likely to change anytime soon, and Israel’s national security is closer to the brink of disaster than ever before. The State Department, for example, is now planning to continue funding the Lebanese Army to the tune of $100 million. Our State Department would be wise to rethink this plan, but Secretary of State Hillary Clinton made it clear in her remarks to Congress last week that U.S. support for Lebanon's armed forces is in American and regional security interests. She claimed that the Lebanese Army is professional and non-sectarian. How can Secretary Clinton possibly not know what we know: that the Lebanese Army has already been deeply compromised by Hezbollah; or that Hezbollah is a client of Iran, which has supplied the organization with nearly 100,000 sophisticated rockets and missiles, biological and chemical weapons, and over 10,000 Iranian Revolutionary Guard Corps (IRGC) personnel to support their war effort. How can she not know that Hezbollah now exercises virtual control over much of the Army; or that Hezbollah is a fundamentalist Shi'a organization (not at all secular); or that our arms, training, and funds will go right into the hands of an enemy determined to destroy both Israel and the US. Our foreign policy, far from “creating stability”, as Clinton has said, is making dangerous choices in a highly volatile environment. We are adding fuel to an already highly combustible mix, and we should not be surprised when once again it bursts into flame. CONCLUSIONS: Just as a small family in the small town of Itamar was the target on Friday night, the tiny nation of Israel (a country the size of New Hampshire) may soon be the target to Hezbollah's 100,000 rockets and missiles). Where will America stand when Iranian missiles rain down on Haifa and Tel Aviv? Will we still be “watching with concern” when one of our strongest allies faces split-second decisions upon which the lives of its population depends? 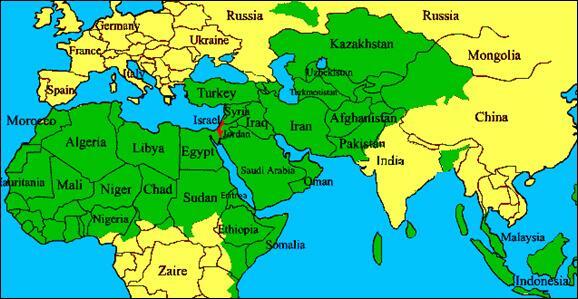 The green in the map represents Muslim countries in Africa, Asia, and the Middle East. Israel is colored red. Can you find it? Ilana is represented by Gerard Group International, Inc. For booking, call 978-270-7531 or email booking@ilana.org. Muammar Gaddafi is making good his threat to either remain in power or leave his people and their country in ashes. While communications from inside Libya are sketchy because telephone, wireless, and computer lines have been distrupted, many reports from the flood of people fleeing the country tell of horrific assaults on unarmed civilians. Thousands of people are scrambling to reach the borders, but the rough Mediterranean waters have made evacuation by sea extremely difficult. Americans, waiting for passage in the port, have been unable to leave the country. There is consensus that the eastern part of the country is largely in the hands of the rebellion, although confirmation of specific locations is difficult as the situation continues to be fluid. In Tripoli's Green Square, where anti-Gaddafi demonstrations were violently attacked by mercenaries on Tuesday night, at least 60 dead bodies were seen in the street this morning, murdered by Gadaffi's mercenaries. Shooting indiscriminately at anyone in their gun-sights, they continue to ravage many parts of the country. Many buildings, including hotels and government offices in the center of Tripoli, have been set alight and are burning out of control, and people who climbed to their roofs to escape the slaughter at street level have been fired upon by helicopter gun ships. Heavy gunfire has been reported in various parts of the country as Gadaffi's mercenaries continue to sow chaos, while officials in his 'government' continue to defect to the anti-Gaddafi rebellion. Five hours of gunfire in the town of az-Zawiya, west of Tripoli, between Army troops loyal to Gaddafi and the residents. Residents, armed only with hand guns and hunting rifles, were no match for the government's heavy weapons. The fighting left over 100 men killed, and over 400 wounded residents swamped the local hospital. The town of Misurata, just east of Tripoli, is the scene of new fighting after falling to the opposition yesterday. A strong security force entered the town today and fierce fighting has been reported. Tribal leaders have come together in al-Bayda, now under the control of the people, to discuss what to do in the face of the wanton murder of their people and the growing chaos in areas still unsecured by the protesters. According to reports, most of the town, which is in eastern Libya, the residents now have weapons, which they took over from the government forces when they gained control of the town. A recent report on chemical and biological weapons assert that Gaddafi has 50 tons of chemical weapons, although he publicly renounced them several years ago. It is thought that these weapons include mustard gas. More of Gaddafi's officers, ministers, and ambassadors continue to defect, including his Minister of Justice, his Director of Protocol, and Libya's Ambassador to Jordan, as well as a group of senior military officers in Benghazi. Libyan officials have accused foreign journalists of entering the country illegally and announced that they will be arrested and considered enemy spies. Meanwhile, America waits for "political concensus" before taking action. President Obama's comments yesterday were deeply disappointing to Libyans who viewed his statement as "weak" and "too little, too late". The people want to hear - minimally - that America is ready to act to provide humanitarian aid to the people of LIbya who are running out of food, water, medicines, and other basic supplies, and they want intercession to stop Gaddafi from ordering further massacres. How will Libya function once Gaddafi is gone? How will borders be protected migrants from other countries? How will oil production be protected and restarted? If Gaddafi follows through on his promise to destroy the oil fields and infrastructure, how will they be rebuilt and what will the impact be on world markets? And finally, and not the least of the concerns, how long will it take Iran and the fundamentalists to exploit this situation and move in to create a new Islamist state in Libya? Even as this is written, Libya's chaos continues to grow. The death toll is unclear but will likely be counted in the thousands. Most of these dead were unarmed civilians, killed at the hands of Gaddafi's security forces and his wild and blood-thirsty mercenaries, whom he recruited mostly from Chad, but also from Algeria and Niger, according to one of his officers who defected yesterday. Identified by their yellow construction hats, videos of them running through the streets, shooting at anyone they see are now being aired on some mainstream media. The toll - not from the demonstrations, but from Gaddafi's massive and unconscionably brutal response - will take some time to assess. But the stories of carnage and destruction coming out of Libya from those who are fleeing are witness to an unconscionable attempt at genocide and national destruction on the orders of Libya's unstable ruler. The inability of world leaders to meet this carnage with anything more that words is unconscionable. Support is limited largely to evacuation of foreign nationals.